Hi Monday, how are you? I scheduled the day off today from working at the hospital as part of my self care plan and somehow a cold decided to follow me. It has been trying to make friends for a couple of weeks and Friday finally got ahold of me. I’ve been going through a lot so I’ve actually been surprised it hadn’t caught up to me sooner. So what did I do today? I slept in. I played with my dogs outside and enjoyed watching them watch the squirrels scamper up the trees. I came back inside and did laundry and dishes and then decided to rest again. Then I decided to go drop some donations off and would see where the drive would take me before my acupuncture appointment. I had a great lunch watching people and looking at the gorgeous fall colors. Enjoyed some sushi and thought of the family I used to nanny in Pittsburgh because that’s where I first tried and fell in love with sushi. And I listened to one of them most fascinating conversations, likely fascinating because by the looks of these two men I never would have guess the words that would fall out of their mouths. They talked of transference, addiction, and being addicted to the unhealthy mindset. Right up this counselor’s alley. And I looked around me and imagined all the lives and hearts of those around me, not really knowing anyone and yet totally comfortable with this fact. So Monday, thank you for helping take care of me. I’m watching, I’m listening. Yesterday I started back to work. By midday I was conflicted because I was so enjoying the training but I was also feeling extreme fatigue from the lack of sleeping the night before. I was starting to feel a little sick to my stomach and as the afternoon progressed I realized I had some control over what was next. Decided to cancel my teeth cleaning, that just was not important today. Visited one of my dearest friends and saw a couple other colleagues, got hugs and empathy. And headed home for a much needed nap. Woke up refreshed and ready for my first private practice session since 10/10/15, the day after I found out my Uncle was admitted on hospice. By evening I felt strong. I took another hour nap and then was able to write like I’d wanted to write the last couple of days. Not to say I haven’t been writing but I’m trying to document my last hours with Uncle Hal and from that come up with a message for Sunday, titled Living Between Life and Death. I’m happy to see my subconscious has been doing a lot of this writing and I got into the flow last night. Today I am back at Riverbend Hospital and on the floor with my MSW student. To think, I was a brand new MSW student in October 2010. We also have a site visit with the field liaison today. I also have one private practice client after work at the hospital. This morning I must draw strength from within. It is going to be okay. I am going to be okay. There is an alley much like this in the same neighborhood at Hal & Gayle’s previous home (of 35 years) on C Street in Springfield, Oregon. It parallels Hal’s shop, which was lit up by an arsonist once upon a time. Today was full of writing, reflection, introspection, and a sense that the journey I have been on is going to change courses. I cannot tell you how it will change at this point except that I am sure of it. There’s this term called post traumatic growth that I came upon in graduate school. It touches on the growth of a person that can occur after trauma/loss. What I’m seeing is a gift Uncle Hal has left me. The gift is revealing itself slowly and as long as I stay open, I believe the doors will continue to open in ways I had never imagined. Just when I start feeling stronger, heart full, mind clear…something hits me again. Stomach hurts, head hurts…I sit, meditate, or try to catch up on some much needed sleep. Yesterday I plunked on the piano for the first time in….who knows how long. Trying to find some music for a tribute I’m working on for next weekend. Shall I call it the pre-memorial? I’m not sure but something was telling me I needed to tell my story of my final hours with Uncle Hal. And there’s probably some other messages weaved in there that I’m only just now unearthing. One thing I’ve let go this year is my photoblog ritual. Perhaps I’ll be re-committing to this again. In any case here are a some photos from before Uncle Hal died. Oh and part of today’s horoscope: Relax your resistance and trust your intuition to teach you how to navigate the murky waters of your heart. Uncle’s Organization: Wishing I had a wall for a chalkboard like this! One of his beloved bike bags: Where is he going now? We’ve had our share of forest fires this summer with this beautiful dry Oregon sun. Have been covering the social worker at the Oregon Rehabilitation Center this week. Today I got to park on the very top of the parking structure where I took this image. Unfortunately my Pentax K-x is still in the shop, will have to pick it up this weekend. Photo taken with my Canon PowerShot A590. Yesterday could have been any busy Monday. My medical social worker self spent the day faxing paperwork, calling insurance companies, communicating appointment times, listening to colleagues’ frustrations, and talking to patients and their families about what’s next. From the hospital I drove to the grocery store in beautiful Oregon weather, with the sunroof open and my grocery list compiled. The young female grocery store clerk asks if I have birds, I tell her about our solo bird- who Jeremy’s recently re-named Buster P. Kublahay the 4th. She shares with me the story of her long lived parakeet, I’m glad she took the time to talk to me. I drive home, only to have a grand idea that I must share with “my best woman” aka maid of honor. I check the mail; the mail box is stuffed. Fast forward to me sitting down for dinner and opening my mail. Chatham University (formerly Chatham College for Women…) had sent me a nice sized envelope with a letter explaining the May 1, 2014 vote to go co-ed. 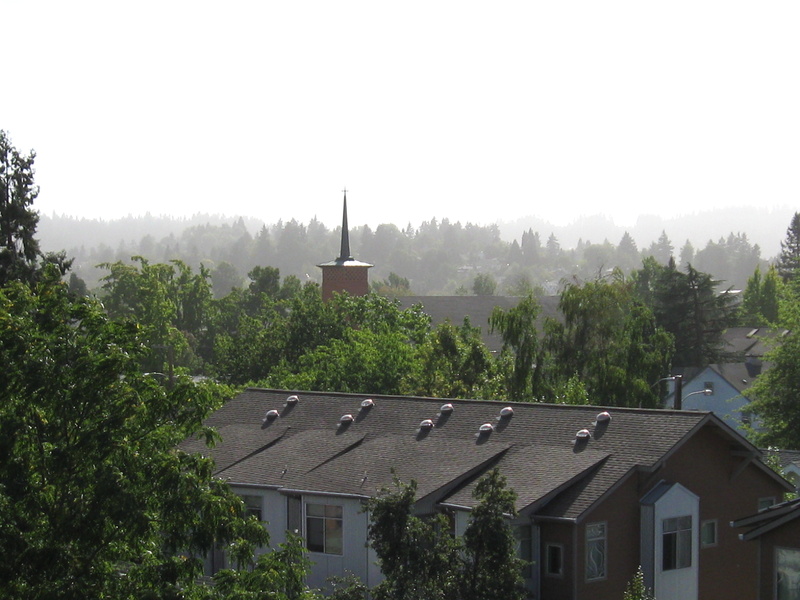 Did you know the state of Oregon was only 10 years old the year Chatham was established? 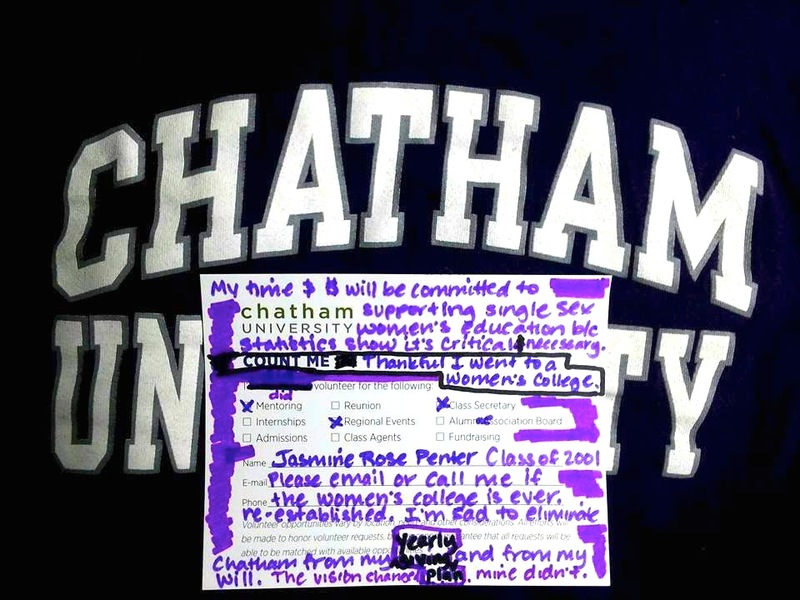 I’m excited because I found the reply card my Chatham sisters had been filling out, the purpose of the card is to inquire about our willingness to volunteer at Chatham University. My purple markers are brought out and I contemplate writing a draft first before I mess up the card. Instead I focus in. I’ve acknowledged I’m back in the stage of anger, utterly disappointed that my Chatham sisters and I don’t have the opportunity to work with the administration creatively to save women’s education at this university. Sad that we’ve found ourselves on the sidelines re-grouping to organize an entity that is separate from the college we loved and admired. The social worker in me is thinking I’d love to start a grief support group for these women that goes beyond the online forums and strategizing we’ve been doing. The social worker in me says, advocate for the rights of the vulnerable. Yes, women are still a vulnerable population, paid less and ranked lower than their male counterparts in so many areas I am not going to tackle that list. My social worker self says, Jasmine you are grieving the loss of an opportunity you wish and dream for women. It is why I love the establishment of education for girls worldwide. Much of what I believe in today is based on an environment that encouraged me to dig deep, always ask questions, and strive for a life I continue to dream about. I’ll always love small class sizes, the opportunity to have discussion with people I admire, and I’ll always support my women friends to acknowledge their fear but don’t let it hold them back from dreaming and DOING. It’s Tuesday morning. I’m going back to my happy place. Their (Chatham University’s) vision changed, mine didn’t. 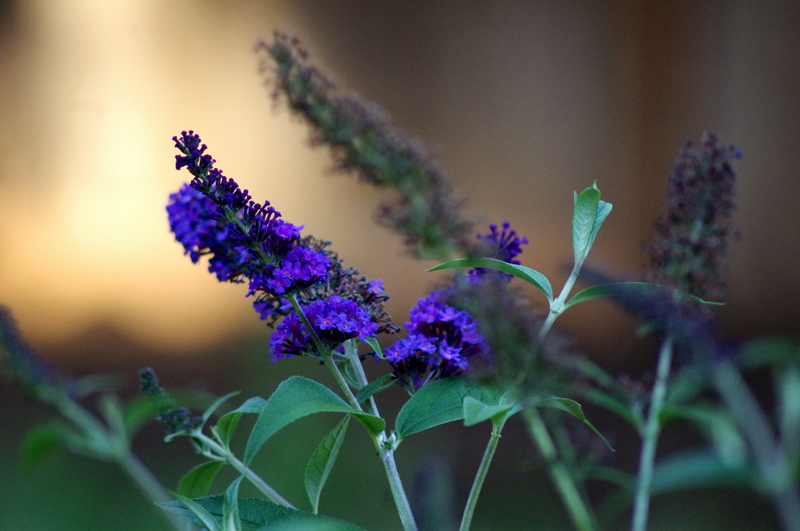 This year a new lilac was planted and it wasn’t by me. I’d like to think one of the local squirrels or one of several backyard finches did us the favor of adding this second lilac to our yard. The days have been passing quickly with the start of my medical social work career. To think just over two months ago I was travelling with my mom to southern California to attend graduation and three months ago I was in the crunch of my last finals. My camera has sat on my desk too many days not taking pictures. Tonight I’ve got the hiccups, so to distract myself I brought out my 180-300 macro lens and started snapping pictures from the backyard. 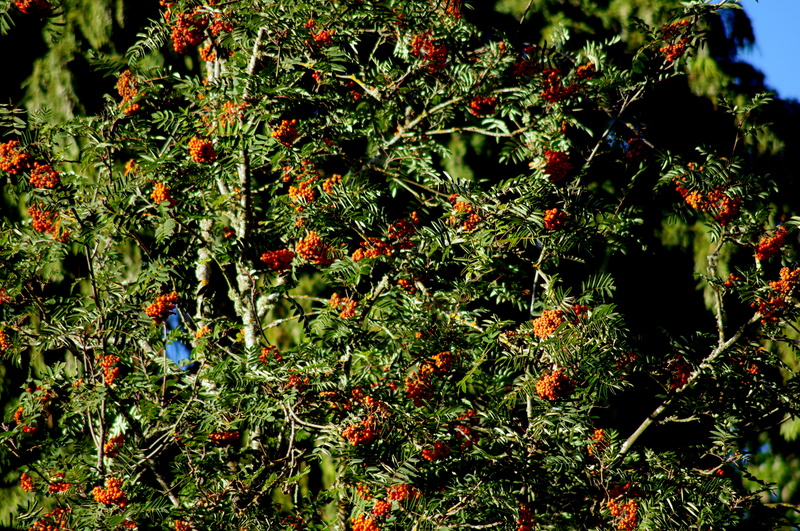 A Rowan tree, which is in the yard of the home behind us. Love the orange and green contrast.